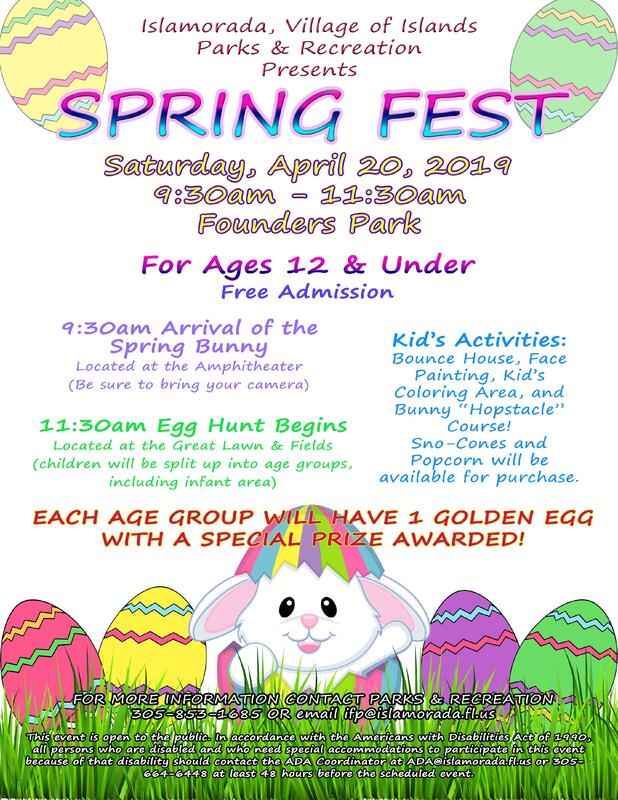 SPRING FEST AND EGG HUNT AT FOUNDERS PARK SATURDAY, APRIL 20, 9:30AM TO 11:30AM. Home More News SPRING FEST AND EGG HUNT AT FOUNDERS PARK SATURDAY, APRIL 20, 9:30AM TO 11:30AM. Bring the family to Founders Park for Spring Fest, a great event for ages 12 and under. The family will enjoy the bounce house, face painting, coloring and a Bunny "Hopstacle" Course! The Spring Bunny will arrive at the Amphitheater at 9:30 a.m. Bring your camera to get a picture of the kids with the bunny and stay for the Egg Hunt that begins at 11:30 a.m. One lucky child in each age group will find a Golden Egg and be awarded a special prize! Sno cones and popcorn will be available for purchase. For more information, contact Parks and Recreation at 305-853-1685 or ifp@islamorada.fl.us. This event is open to the public. In accordance with the Americans with Disabilities Act of 1990, all persons who are disabled and who need special accommodations to participate in this event because of that disability should contact the ADA Coordinator at ADA@islamorada.fl.us or 305-664-6448 at least 48 hours before the scheduled event.